The first-place Washington Nationals had an opportunity Friday night to increase their division lead, and they took advantage, defeating the San Diego Padres 7-5. The Nationals record improves to 43-25, six games ahead of the New York Mets in the National League East, while the last-place Padres drop to 27-42, trailing the San Francisco Giants by 16 lengths in the NL West. The Mets lost to the Braves 5-1 at Citi Field earlier in the evening. That may have been a little extra motivation for Daniel Murphy to deliver the big hits (home run, double, 3 RBI) in San Diego and put more distance in the standings between his new team and his old one. Murphy’s 2-for-4 night lifted his batting average to a league-leading .361 to go with 12 home runs and 45 runs batted in. The Padres opened the scoring in the bottom of the first as right fielder Matt Kemp stroked a single to score center fielder Jon Jay (3-for-5), shortly after Jay legged out the first of two doubles – increasing his league-leading collection to 24. 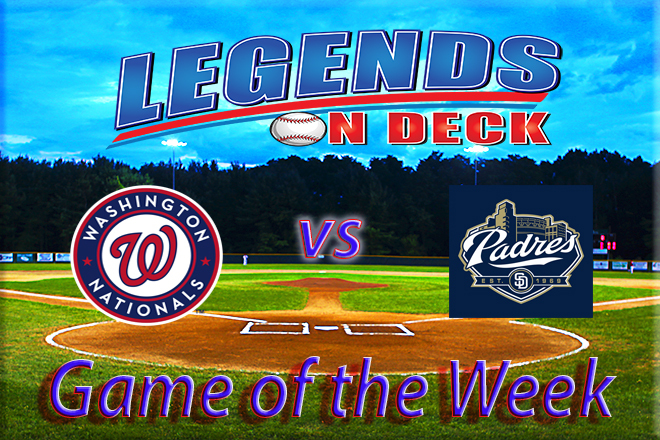 Nats first baseman Ryan Zimmerman, like Murphy back in the lineup after a day off, crossed the plate in the top of the second as third baseman Anthony Rendon lofted a sacrifice fly to even the score at 1-1. The Nats rallied for four runs and a 5-1 lead in the third. Daniel Murphy lined a double that rolled to the right field wall past Kemp, scoring Jayson Werth and Bryce Harper. Zimmerman then drilled a poorly-located Christian Friedrich breaking pitch into the left field seats. Shortstop Alexei Ramirez scored for the Padres in the fifth on a lob wedge single by Jay into right field, making the score 5-2. Moments earlier, Nats catcher Wilson Ramos turned a sacrifice attempt by Friedrich into a force play at third, limiting the damage. Murphy continued his torrid hitting as he lifted another Friedrich delivery over the opposite field wall in the sixth. With two outs Rendon walked and shortstop Danny Espinosa singled, then pitcher Joe Ross singled to send Rendon around third. Left fielder Melvin Upton Jr. fielded the base hit and threw the ball on one hop to catcher Derek Norris, who tagged a sliding Rendon to end the inning. Derek Norris struck a line shot off Ross over the low fence in left field to get a run back for the home team in the Padres half of the sixth inning. The Nats volleyed back in the seventh as Harper hit a seed through a drawn-in infield off reliever Carlos Villanueva, plating center fielder Michael A. Taylor to make the score 7-3. After the seventh inning stretch, the Padres scored a pair on successive fielder’s choice ground outs, tightening the Nats lead to 7-5. Kemp made the second out of the inning at second base on an strange and possibly decisive play. Espinosa dropped a glove flip from Murphy on a force play at second base but Kemp slid so early he allowed Espinosa to recover in time to make the out. Joe Ross (6.0 innings, 3 runs, 6 hits, 6 Ks and 2 BB) earned the win to bring his record to 6-4, with a 3.13 ERA. Left-hander Christian Friedrich (6.0 innings, 6 runs, 9 hits, 3 Ks and 2 BB) was tagged with the loss and now owns a 3-2 record and a 3.15 ERA. Yusmeiro Petit stepped up in the absence of injured closer Jonathan Papelbon and interim closer Shawn Kelley (who was not available) and earned his first save of the season. Rookie Ryan Schimpf was a bright spot for the Padres, getting on base three times (two walks, one double) in four plate appearances.